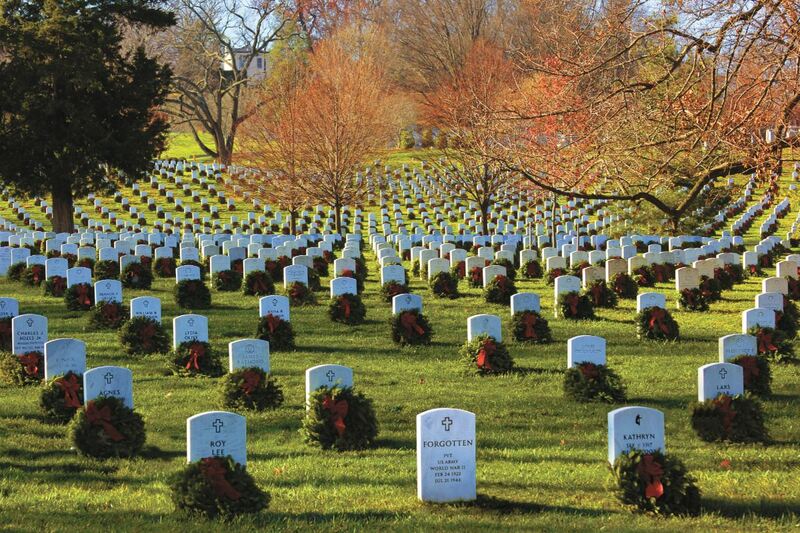 Wreaths Across America knows hometown heroes are buried across this great nation in cemeteries north, south, east and west of Arlington National Cemetery. 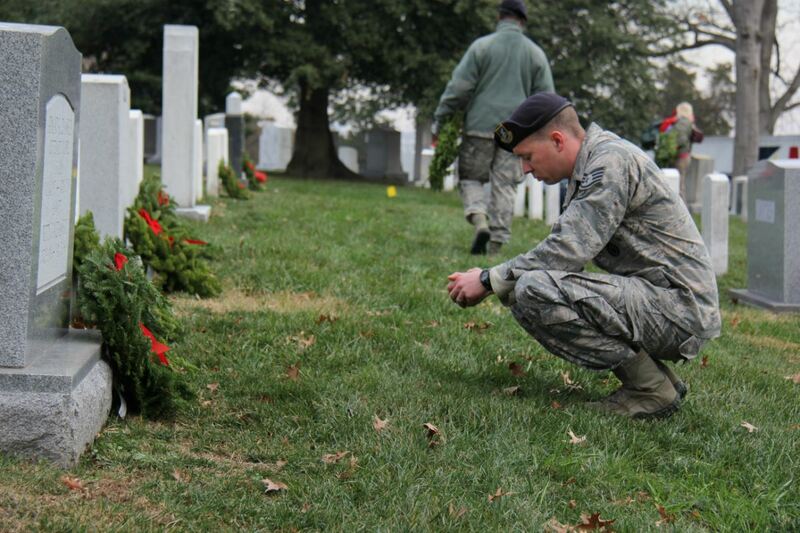 Hundreds of thousands of committed volunteers are working to ensure the names of our fallen are spoken in 2016 in over eleven hundred participating locations on National Wreaths Across America Day Saturday, December 17. 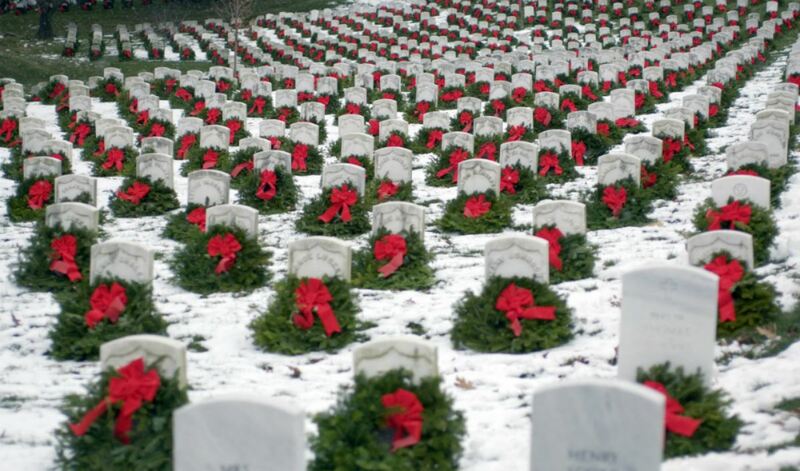 The preceding Monday, most, but not all of our state capitals host ceremonies with our ceremonial wreaths representing all branches of the military, our missing in action, and prisoners of war. Charlotte Chism Waldrum is the Location Coordinator for Oak Grove Memorial Gardens in Irving and the Texas State Capitol event in Austin. Additionally, this year her expertise and experience have led her to serve as a Co-Coordinator for the ceremony at Texas State Cemetery. 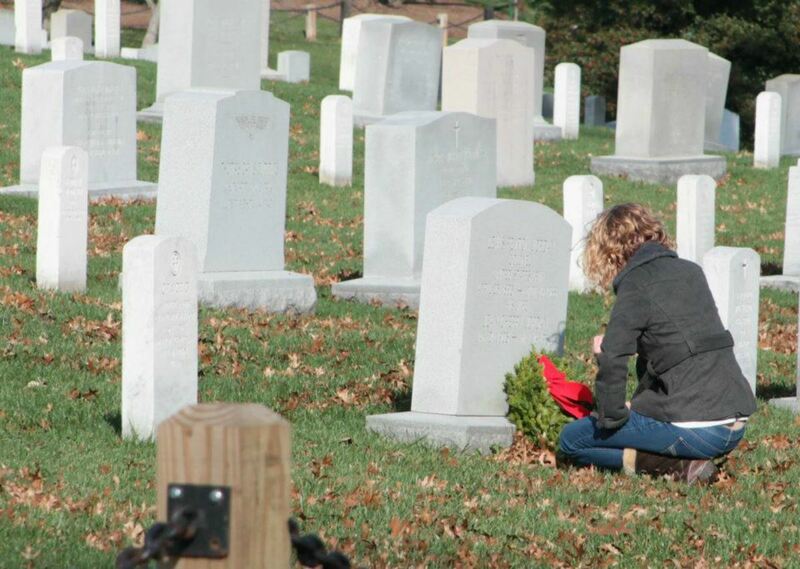 Our volunteers tell us, once they placed their first wreath they were "hooked" on the mission of Wreaths Across America to remember, honor, and teach. Charlotte Waldrum has been volunteering for eleven years with other members of the Texas Funeral Directors Association. "Patriotism runs deep in my family," explains Charlotte of her dedication to the mission. "My Father, Harrell W. Chism, was a Captain in the U.S. Army serving in the Korean War and several of my uncles served as well." Charlotte says she'd been volunteering for a while, but it wasn't until she told Sgt. 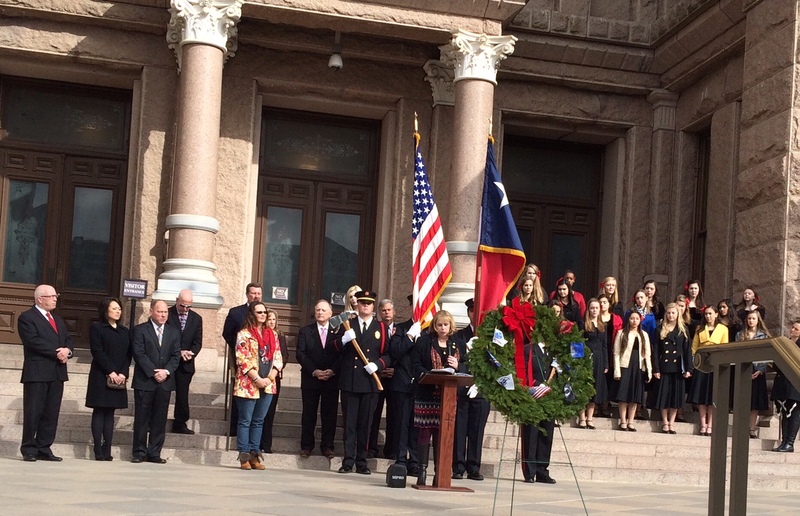 Tanner Stone Higgins' story one year during the state capitol ceremony for his Mother Patti Stone that she fully appreciated the value of the Wreaths Across America mission. Patti is a childhood friend of Charlottes, and her son Tanner was killed in Afghanistan. Just before the ceremony, Patti had spoken to her other son Dillon who was also serving and felt emotionally unable to speak about her son publicly. "I got to tell Tanner's story and to share that for Patti meant more to me than the whole time I've done these ceremonies. At that point, I really and truly understood the importance of the ceremony for a family who has lost someone. Our children need to be taught to understand what these families have given up." 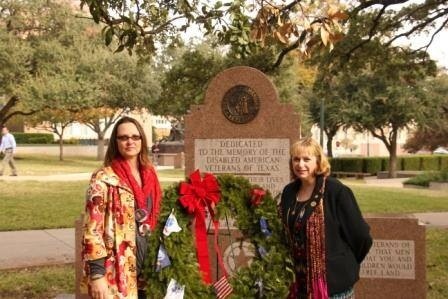 Charlotte tells us several local chapters of the Daughters of the American Revolution are fundraising to support remembrance wreaths for Wreaths Across America Day, and there are approximately two thousand, eight hundred graves at Texas State Cemetery. 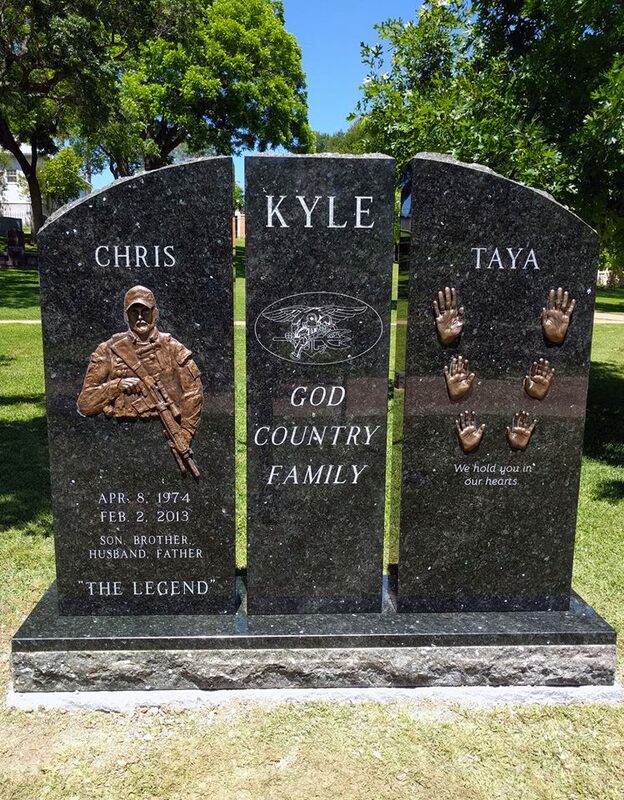 One hero buried at Texas State Cemetery is U.S. Navy SEAL, Chief Christopher Kyle. 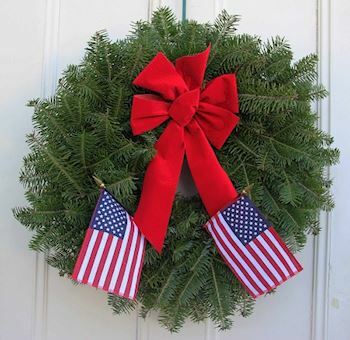 His widow Taya Kyle, Executive Director of the Chris Kyle Frog Foundation, recently spoke of the "ripple effect of kindness" as it relates to the Wreaths Across America effort. Charlotte says Taya will personally honor Chris this year with a remembrance wreath. When asked why she's willing to put forth such tremendous effort as a Wreaths Across America Volunteer year after year Charlotte responded without hesitation. "We want to make sure that in society people learn to respect the men and women who have given up their all for us. I can't imagine living in a country where we did not have the freedoms we have." Clearly, Charlotte is not alone in her thinking. 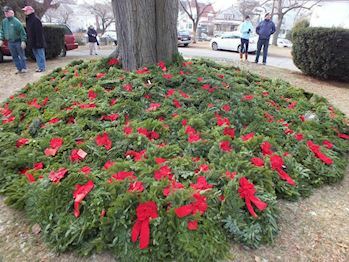 When she started wreath-laying efforts at Oak Grove six years ago, volunteers placed three hundred sponsored wreaths and last year one thousand four hundred remembrance wreaths were laid. Charlotte and all of our Location Coordinators are ramping up plans for their state capital and local cemetery ceremonies for 2016, and together we will say their names, so no one is ever forgotten. 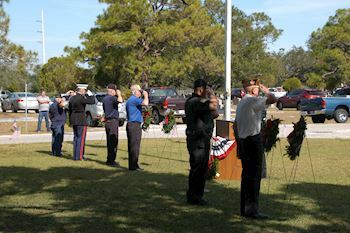 Both Wreaths Across America ceremonies at Oak Grove Memorial and Texas State can use interested volunteers. 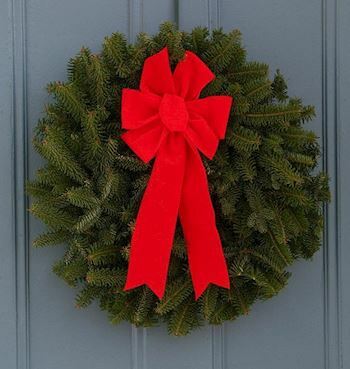 If you're interested in sponsoring a wreath at these locations, you can do that here.